My breed has been around for a long, long time. Sir Walter Scott's Guy Mannering (published in 1814) is when I got my name, but I'd been around even before that. My ancesters were badger and otter hunters, so they had to be very brave and strong, but I don't hunt much so I have a calmer personality.......... not to be confused with docile, though! I am intelligent and I have a strong will and my owner says that I can be quite stubborn at times. My body is long and short, and my head looks large for my size because of my hairdo. My coat can't be described as hard, because I do have some soft hairs too, but I'm not soft and fluffy all over. When fully grown, I am between 8 and 11 inches tall (20.3 to 27.9 centimeters) and I weigh between 18 and 24 pounds (8.1 to 10.8 kilograms). We have no Dandie Dinmont Terrier Breeders listed at this time. 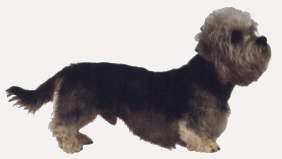 Click here to place your Dandie Dinmont Terrier Ad!